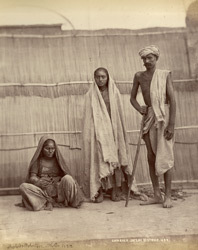 Group portrait of Sansis in the Delhi District of India, taken by Shepherd and Robertson in c.1863. This image, of two women and a man of the Sansi tribe, is reproduced as illustration no.195 in volume IV of John Forbes Watson's The People of India (1869). The accompanying text states, "The wandering tribes of India form a very remarkable feature of its population...They have been vagrants from the earliest periods of Indian history...Among these tribes the Sanseeas occupy a place of pre-eminent notoriety...They are admitted to no other caste fellowship, ministered to by no priests, without any ostensible calling or profession, ... no settled place of residence whatever; they wander as they please over the land."